The 24-year-old man arrested in connection with the killing of Francesco Cali, a reputed boss of New York's Gambino crime family who was gunned down in a brazen hit last week, wrote pro-Donald Trump slogans on his hand and flashed them to journalists before a court hearing Monday. 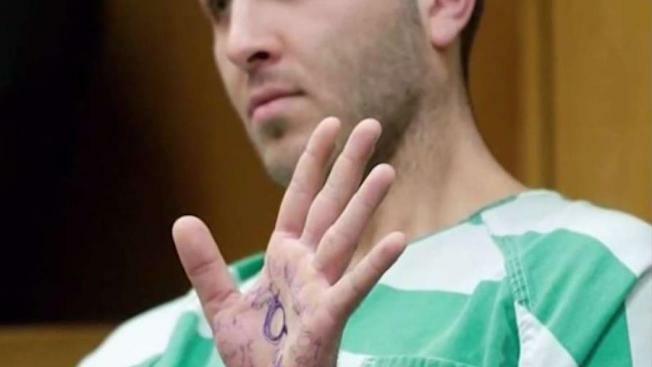 Handcuffed and dressed in green stripes, Anthony Comello, of Staten Island, tried to use his hands to block the cameras from his face as he sat in the jury box. On it were scrawled pro-Trump slogans including "MAGA Forever," an abbreviation of Trump's campaign slogan "Make America Great Again." It also read "United We Stand MAGA" and "Patriots In Charge." In the center of his palm he had drawn a symbol for QAnon, a conspiracy theory about the president widely circulated on 4Chan and other far-right message boards. It was not immediately clear why he had done so. He referred all other questions to Comello's Manhattan lawyer, Robert Gottlieb, who said in an emailed statement his client has been placed in protective custody due to "serious threats" that had been made against him, but gave no details of them. Ocean County officials could not immediately be reached after hours on Monday. "Mr. Comello's family and friends simply cannot believe what they have been told," Gottlieb said. "There is something very wrong here and we will get to the truth about what happened as quickly as possible." The statement did not address the writing on Comello's hand, and a lawyer from Gottlieb's firm declined to comment further Monday evening. During the hearing, Comello did not speak other than to say, "Yes, sir" to the judge to respond to several procedural questions. Camello was taken into custody at a home in Brick, New Jersey, on Saturday. Investigators anticipate returning him to the city to face murder charges for Cali, said NYPD Chief of Detectives Dermot Shea. Police are investigating whether other people were involved as well as a possible motive, Shea said. The gun hasn't been recovered, but law enforcement sources familiar with the case say the killing doesn't appear mob-related. One source described Camello as a "conspiracy theory type" of guy while a second source said he appears "a bit off." Camello was picked up at the Brick home by the NYPD and U.S. Marshals, sources familiar with the investigation said. His pickup truck was found on Staten Island and cellphone records may have helped lead police to Brick. Investigators began retrieving video from NYPD cameras positioned on the pair of roadways that lead in and out of Todt Hill, another source told NBC 4 New York. Surveillance video from the shooting scene is grainy, the source said. Shea said Thursday that 12 shots were fired, with at least six striking Cali, who tried to use his car as a shield to protect himself during the shooting.